Beneath the notice of the mundane mortal world, spreading its influence across the Changeling Courts, Mage Consilium, Vampire City, Werewolf Packs and those Mortals who know much more than their fellows, a sixth, pseudo-Faction at play in Portland is The Embassy � a cross-faction coalition which works towards one primary goal: Protect the Secret. In the wake of a massive Faction War still in the recent memory of many, The Embassy has established a tenuous �peace� Accord which demands and enforces that, before all else, the existence of the supernatural must be kept from mortal knowing. Beneath this Accord, the various Factions have at best allied and at worst agreed to co-exist under the threat of mutual destruction. Outsiders and newcomers often find the Accord strange, sometimes abhorrent, but it is also an appealing draw. Not only does the local population accept it, but many take pride in their progressive, visionary new model. Will the Accord continue to hold against suppressed tensions and threats from without and within? The Embassy Hotel: a fine, old structure of classic Portland brick. Initially established more than a century ago, it�s one of the oldest hotels in the city still in operation. Throughout the years it has gone through several renovations and expansions, though respect and homage has always been paid to the original architecture and design. 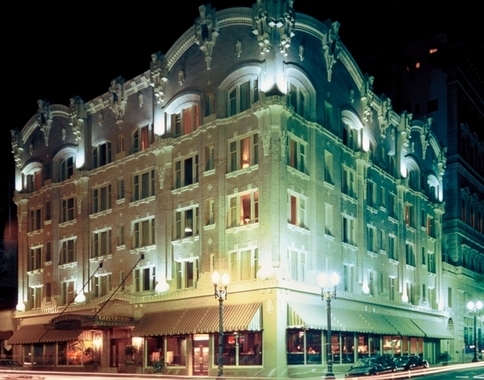 In its current life, and due in part to a relatively recent embrace of the �Keep Portland Weird� culture, the Embassy Hotel has been classified as a �boutique� hotel specializing in uniquely and individually designed rooms that emphasize local arts and culture. Even so, the Hotel offers 331 rooms including suites, more than 13,000 square feet of meeting and conference rooms, a ballroom, fitness center and a restaurant on the top floor. For those with a more supernatural view of the world, and particularly those who are new to the city, the Embassy Hotel seems to be a magnetic beacon. Guests who enter through the front door, without malice against the hotel, find themselves in a separate lobby, mirroring the mundane, but catering to the opposite. The Embassy Hotel is considered by all to be Neutral Ground making it a place where new arrivals can safely rent a room while they figure out the lay of the land and long time residents can meet in peace or at least under an accepted cease-fire. Physical or supernatural acts of aggression or violence upon another guest of the Hotel is met with by punishment from the Hotel itself - often via immediate expulsion, but sometimes the Hotel gets creative and a naughty guest will find themselves wandering hallways with no exit or end for ages. Former guests who are no longer welcome to the Embassy Hotel will have a difficult time remembering exactly where it�s located and exactly how to get inside. Memory of events that occurred there will be less fuzzy, but never enough to help guide the banned person to returning. Similarly, the Hotel staff make certain that former guests who are no longer welcome are announced to other guests. But those who agree to the terms of peace afforded by the Embassy Hotel can find themselves a safe place to rest and meet with others. The staff are often unseen and are excessively discreet when it comes to private matters. And although the Faction Leaders throughout the City may or may not get along on any particular day, all have been bound to an agreement to protect the Neutral Grounds. ALL supernatural powers of any sort have a −5 penalty to their dice pool on Embassy grounds. At ST discretion, healing/restorative powers that are announced and the recipient is willing to receive might waive this. Powers altering/weakening/harming the Embassy itself, whether physically, temporally, spatially, spiritually, fate-wise, creating large scale illusions, or similar effects of any kind, or altering the space/time/fate/realm/etc of those within, will cause a Clash of Wills with the wards and needs a staff member present (or simply fails). If done for a hostile reason, the user is subject to being �shunted� out (see below). Stealth power usage similarly requires a Clash of Wills against the embassy, or it fails as soon as one enters the Embassy�s area of influence. If the power was being used for a hostile reason, they�re subject to being �shunted�, as described below. “Shunting:” Power usage done in any sort of �hostile�, �debilitating�, or even simply �debuffing� manner will trigger the Embassy�s wards. Whether the effect succeeds or fails, the intent becomes obvious to the Wards immediately after completion, and the perpetrator is teleported out of the Embassy (if needbe, it will Clash powers meant to prevent this; if it fails, it will �try again� on subsequent turns until it wins). Extreme instances, such as attempting or succeeding at killing someone, or similar heinous offenses against Accord members or the Embassy itself, will involve being �shunted� into a sort of internal �Labyrinth� within the Embassy; these are closed off rooms and looping hallways that are outside of normal reality,and don�t touch upon typical realms. Teleportation can only get out of this if it�s capable of doing so through unknown realms, and requires a Clash as normal. Should someone end up in such a room, the Ambassadors will immediately become aware. Mundane hostile actions will cause the user to be shunted as soon as the hostility of it is �obvious� to a theoretical neutral observer. Drawing a knife and pointing it at someone is enough to trigger it, for instance. Similarly, �intimidating� actions meant to provoke or subdue will also cause this reaction. Over the course of the Embassy�s existence, it�s become clear that to help prevent disputes and inform others of territorial claims, as well as to provide information about locations in general without needing to send messages out to the various leaderships, a system would need to be put in place to allow individuals knowledgeable of the Embassy to recognize these claims and messages at a glance, without requiring some sort of database or constant message passing. As a combination of the techniques used by the individual factions before the War of Four, the Ambassadors and those affiliated with them have come together and created what are called �Embassy Seals�, which act as an at-a-glance marking system at the edges of various buildings, locations, and areas to allow those in the know to discern who it belongs to, if it�s safe to enter, and whatever other information those who control the area (or simply oversee it) may wish to pass on to others. They�re often a combination of simple symbols, miscellaneous markings (claw scratches, for instance), or perhaps even little attached trinkets or forms of decoration. In general, these are short messages, generally dictating who controls the area (Vampires, Werewolves, the Embassy), and if it�s meant to be solely for them or if it�s �Neutral Ground�, that is, open to anyone who follows the Embassy�s rules and those of the owner. Some other general �status� markings have been developed recently, such as �Danger� (meaning the location is a risk for anyone, but not necessarily barred), �Safe� (meaning those within are usually willing to provide shelter or �sanctuary� to those that ask), and similar descriptors. Of course, individual Factions have found ways to personalize their symbols a bit, to make it recognizable as belonging to a smaller group within the faction, but with the general Faction still recognizable to anyone else. For instance, many Werewolves will add a first tongue sigil into the design, representing the Tribe or Pack that controls the area specifically, whereas anyone else can still recognize it as being Werewolf controlled. To note, use of this system is not required, in the case of those preferring to keep their holdings secret, but any misunderstandings caused by that must be lived with by the owner. Note that the Embassy does not support ‘No Passing’ as a seal for controlled neighborhoods (though is fine for private property), and those attacking others for simply walking through the area will generally be treated the same as if it were entirely unprovoked. Actively damaging such territory, or hunting despite a ‘No Hunting’ seal, of course, is a different matter. For the most part, Seals are recognizable to anyone affiliated with or at least abiding by the Embassy without any rolls. Recognizing a sigil belonging to another faction as representing a sub-group may require a Wits + Politics, Streetwise, or Occult roll, in which case it�s recognizable as either belonging to a sub-faction (or pack-equivalent, or lineage, etc), or to those that have experience with them, it�s recognizable as that specific group. The Masquerade, Veil, and other termed secrecies of the combined factions will be considered paramount, and shall not be violated. Should a breach of any of these secrecies occur, it is the requirement of each faction to help end the threat to the combined people, for if one of our secrets falls, surely all shall. While there may be political maneuvering between members of each faction, or the possibility of violence between individuals, it is the will of the Assembled that those of each involved faction deal with their members as appropriate to the situation. Those that repeatedly are punished in such a way may be considered enemies of the state, and dealt with b either Trial or Challenge, detailed later in this document. Acts taken against this Accord by a Faction shall be met by the combined might of the other Factions. War comes at too great a cost. As such, war shall never come to pass again between our collective peoples without a true and known threat against the safety of the city by one or more factions within the city. While we do agree to police our own, we do agree that repeated offenses shall be dealt with by a tribunal assembled of each faction�s representatives, by which the accused may choose from the following options: Trial: The accused may request a trial, by which he may choose one person to represent him, and one person shall be chosen to act against them. The trial will be by evidence and debate, with a single member of each faction standing as a panel of judges and the jury, deciding the fate of the discussion and evidence. A majority is required for either a guilty or innocent verdict, and upon finding guilt, the four not from the accused�s faction will decide the punishment, which may be up to and including banishment or death. Challenge: The accused may instead decide to challenge one of the faction�s Ambassadorial members. Which will give that Ambassador the choice of what the challenge shall be. The length of the challenge may not be anything that takes longer than a week to accomplish. If the accused successfully completes the challenge, they will have the charges against them dismissed. Should they fail, they will suffer the judgement of the others, as if he had been found guilty of a trial. The Ambassadors not involved in the challenge will act as fairness judges during the challenge to make certain that the rules of the challenge will be followed in both word and spirit. We, the signatories below, do hereby ratify this Accord on behalf of our respective leaders, in the Vitae of the Reverend Prince himself, bound by the Wyrd, guided by Fate, before an Elodoth of the Forsaken, and at the Word of the Rose City Guild. The Shadow Accord Negotiated in good faith between the Maga known as Hecate and the Emissary of the People named Charlotte Caine, known to the people as Soulless. On this date, 18, June of the year of 2018. We the undersigned do recognize and adapt the resolution of the treaty and Accords related to the Hisil and the realms and abodes of the Spirits between the Consilium and Free Assemblies and the Uratha Packs of the city of Portland, Oregon. Here we agree and sanctify that all parties involved understand that the sanctity and well being of the Shadow, known as the Hisil to the People, are of paramount importance. That no entrant of the Shadow shall intentionally, or through fault of their own, act to cause damage or harm to the landscape nor seek to maliciously interfere with the conduct or duties of the Courts residing therein. Further, all parties involved in activities in the Shadow shall afford each other proper respect. Consisting of, but not limited to, Awakened entering the territory of the Uratha within the Shadow shall be required to announce themselves upon entry to either Pack representatives, or, should none be present, to spirits or totems present in that pack territory. No Awakened shall interfere with Uratha business or territory without that pack�s expressed consent as witnessed by their pack Totem. No Uratha shall interfere with Awakened duties once consent has been given, or they are outside of Pack territory. Though this protection is nullified should the Awakened pursue activities contrary to the aforementioned conditions. Should the Awakened forcibly attempt to control spirits within the Shadow, the Awakened shall lose any and all protections afforded by this Accord. The exception to this clause being the creation of fetishes, and returning rogue spirits to their assigned Court. Or the destruction of dangerous, or hazardous spirits to the realms. Should this Accord ever come into dispute, the parties shall settle the disagreement through either arbitration, in which an independent arbitrator determined by both parties, shall hear the complaints and come to a decision.Or the parties will settle their dispute through combat, to first blood. The aggrieved party shall have the right of choice of which route to take. These Shadow Accords are subsequent and in addition to the agreed upon Accords of the Embassy of Portland, Oregon. Let there be no question that these Shadow Accords be taken above the law that protects the City of Portland and maintains the peace. We, the undersigned do hereby ratify these Shadow Accords on behalf of our respected leaders and the communities which we represent in these affairs.